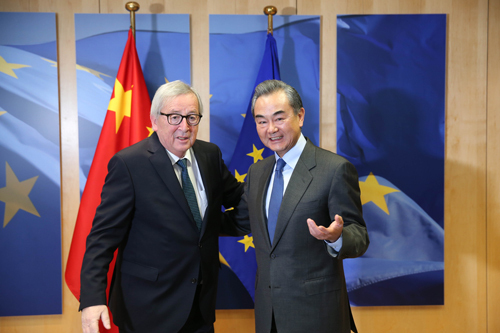 On March 18, 2019 local time, President of the European Commission Jean-Claude Juncker met with State Councilor and Foreign Minister Wang Yi in Brussels. Jean-Claude Juncker asked Wang Yi to convey his warm greetings and best wishes to Chinese leaders. Jean-Claude Juncker said that the European Union (EU) and China will hold a new round of summit in April. I am looking forward to Premier Li Keqiang's visit. I am ready to push for new progress on some important issues in the spirit of mutual respect, seeking common ground while shelving differences and expanding cooperation so that the summit will yield positive results. The EU and China are friendly strategic partners. We hope that the two sides will help each other and work together to shoulder the common responsibilities for the well-being of the world and the future of mankind and leave the sound EU-China relations to the next EU institutions. 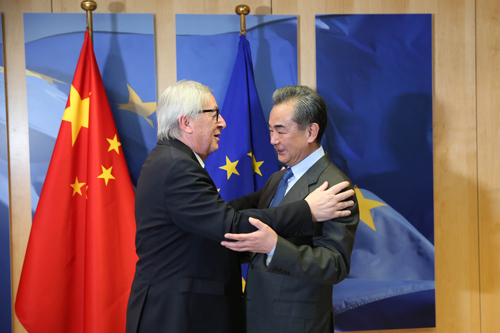 Wang Yi conveyed the warm greetings from Chinese leaders to Jean-Claude Juncker. Wang Yi said that today I held the China-EU High-level Strategic Dialogue with High Representative Federica Mogherini and held a collective dialogue with the foreign ministers of the 28 EU countries. The collective dialogue is the first of its kind. It has worked well and played a role in enhancing trust, resolving disputes, cementing understanding, building consensus and promoting cooperation. Wang Yi said that an important task of my visit is to make preparations for the China-EU Summit to be held next month. The meeting this time was the last under the current EU institutions, and we appreciated President Jean-Claude Juncker and your colleagues for making important contributions to China-EU cooperation. The Chinese often say that things should start well and end well. We are ready to make joint efforts with the EU side to push for new progress in cooperation in key areas and in the negotiation on the China-EU investment agreement, so as to achieve more positive outcomes at this year's summit, lay a sound foundation for greater development of China-EU relations and constantly elevate the China-EU comprehensive strategic partnership to new stages.